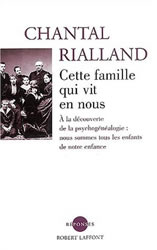 chantalrialland.com : "Cette Famille qui vit en nous"
From the moment you are conceived you are the object of your family projections. You may or may not have been planned. Your parents may have expected a boy or a girl. Long before you were born they had particular hopes for the kind of body you would have, the kind of personality you would have, and the kind of talents you would have. In the beginning you are, more than anything else, an imaginary child. At birth you are given one or several first names and a last name. Growing up you are defined and labeled according to your physical, sexual, emotional, and intellectual characteristics in relation to the members of your family tree, and by comparison with brothers and sisters. Throughout your childhood you identify with your parents. These giants represent the definition of the world, truth, and reality to your childish self. You imitate them and learn through them what it means to be a human being, a man or a woman, a couple, and finally a family. Through them you discover what life is. Your parents raise you in the manner in which they themselves were raised. Or sometimes they do the opposite. In order to understand yourself it is crucial to know the relationship your parents have or had with their own family. Even if you never knew your grandparents they are an important part of your history, and if they are alive they are a great source for understanding who you are. Experiencing your family’s projections and identifying with your parents and certain members of your family tree, you unconsciously settle on a system of repetitive behaviors or opposite behaviors. The first objective of Psychogenealogy is to make you aware of "this family within." You are the result of many projections, identifications, and patterns. Deep within you live not only your parents but also their parents, your grandparents, and even your great-grandparents, whom you probably never knew. Your brothers, sisters, and cousins are also present, as well as your uncles and aunts, a handful of family friends, adults who have been at your side during childhood (teachers, neighbors, priests, your friends' parents), and your friends. The second aim of Psychogenealogy is to free yourself, discover your true personality, learn to love and be at peace with yourself, and to love other people better. Your family history has positive aspects that you must learn about and use. It also contains negative influences that you must transform. And if you have children this book will help you give them the best of yourself and your family history.